In 1983, Chuck Hull invented the first 3D printing process called ‘stereolithography’. It was defined as a ‘method or apparatus for making solid objects by successively “printing” thin layers of the ultraviolet curable material one on top of the other’. This patent only focuses on ‘printing’ with a light curable liquid, but after Hull founded the company ‘3D Systems’, he soon realized his technique was not limited to only liquids, expanding the definition to ‘any material capable of solidification or capable of altering its physical state’. With this, he built the foundation of what we now know today as additive manufacturing (AM) – or 3D printing. 3D printing is the process of making three dimensional solid objects from a digital file. The process is opposite of subtractive manufacturing which is cutting or hollowing out a piece of metal or plastic through the operation of a milling machine. The creation of a 3D printed object is achieved using additive processes – layers of material laid down until the object is created. It allows manufacturers to produce complex and functional shapes using less material than traditional manufacturing methods. Regardless of industry or profession, 3D printing can be beneficial. For the finished product to be beneficial it must function as expected. To that end, the printer must work within exact parameters. To achieve that, the equipment being used to cut and layer the materials needs to be precise and meet the highly sensitive output required. Universe Optics will work with your team to deliver a precision lens to ensure your design cuts and layers the finished product exactly as anticipated. Over the years, 3D printing has found its way into many sectors. 3D printing is no stranger to the automotive industry when it comes to both prototypes as well as finished parts. Among others, many Formula 1 racing teams have been using 3D printing for prototyping, testing and ultimately, creating custom car parts that are used in competitive races. Did you know that the majority of today’s hearing aids are 3D printed? The medical and prosthetics field has largely benefited from the adoption of 3D printing. Custom shapes such as hearing aids no longer require manual labor, with 3D printing they can be made with the click of a button. This means substantially lower costs and lower production times. Perhaps one of the most telling examples of how 3D printing is revolutionizing the medical community comes in the form of the e-NABLE prosthetic hand. The free and easy-to-make 3D printed prosthetic hand is designed to be easily created for children in need of a prosthetic device. When produced through conventional manufacturing methods, these devices can cost tens of thousands of dollars. Before the introduction of 3D printing into the field of architecture, creating scale models was an extremely laborious and time-consuming process that was vital for architects to communicate their design intent. Today, both large firms and independent architects can quickly and easily create 3D printed scale model directly from their existing CAD data that is used for developing blueprints. Depending on the desired level of communication, these 3D printed models can be printed in multiple materials and realistic colors. Perhaps the most famous use of 3D printing was in 2014, when the International Space Station printed a ratchet wrench. “If you can transmit a file to the station as quickly as you can send an email, it opens up endless possibilities for all the types of things that you can make from CubeSat components to experiment hardware. We even may be able to make objects that previously couldn’t even be launched to space.”, said Niki Werkheiser, the space station 3-D printer program manager at NASA’s Marshall Space Flight Center in Huntsville, Alabama. It is predicted by some additive manufacturing advocates that this technological development will change the nature of commerce, because end users will be able to do much of their own manufacturing rather than engaging in trade to buy products from other people and corporations. 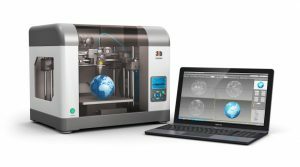 3D printers capable of outputting in color and multiple materials already exist and will continue to improve to a point where functional (electronic) products will be able to be output. With effects on energy use, waste reduction, customization, product availability, medicine, art, construction and sciences, 3D printing will change the manufacturing world as we know it.